Where to start when one has been away for multiple days? After nine very blah days, I returned to [almost] full health in time to teach CyclingSavvy the first weekend in October. For better or worse (perhaps better because my energy levels were still a bit low), the weather had other plans. We made it through most of the “parking lot drill” portion of the class, including some low-speed drills on a freshly blacktopped parking lot that was quite slippery after a brief rain shower. However, after two wet-pavement-related crashes (and with more storm clouds looming on the radar), we cancelled the afternoon road tour portion of the class. I biked home, ate lunch, and passed out on the couch for two hours. The following Monday, Gabriel and I visited a county park, where I just happened to come across some fresh persimmons. We snacked on some in the park (Sir is a fan), and I gathered a small bag for later consumption. After painstakingly processing many of them into pulp, which later became persimmon custard, I’ve concluded that persimmons are best in small quantities, enjoyed raw, unless you have some sort of awesome way to separate the flesh from the seeds. I originally thought our Foley food mill would serve well, but some places advised against it due to risk of scraping bits of seed into the final product. So I removed hundreds of seeds by hand. The custard is okay, “interesting” is a decent description — not bad, but probably not worth the trouble in the future. By the time we encountered a persimmon tree right next to our campsite during this past weekend’s camping adventure (more on that in an upcoming post), I had had my fill of the fruit. Having used the trailer recently and having decided that it’s workable, but not ideal, I’m back to having Gabriel in the front seat, trying to maximize the time we have to ride that way before he really and truly outgrows the thing (he’s still a few pounds under the 38-pound weight limit, but height-wise, his legs are already scrunched). Last Friday morning, I turned what could have been tedious errands, if done by car, into a lovely 6-mile ride, stopping at a bakery, then making milk and [Schlafly pumpkin] beer runs. This morning marked my first chilly weather ride. By the time I left the house shortly after ten, I assumed my gloves and under-helmet hat would be overkill, but I brought them along just in case and quite happily donned them before my ride. Nothing like some crisp, cool, fall riding! This entry was posted in Biking, Food and tagged locavore. Bookmark the permalink. 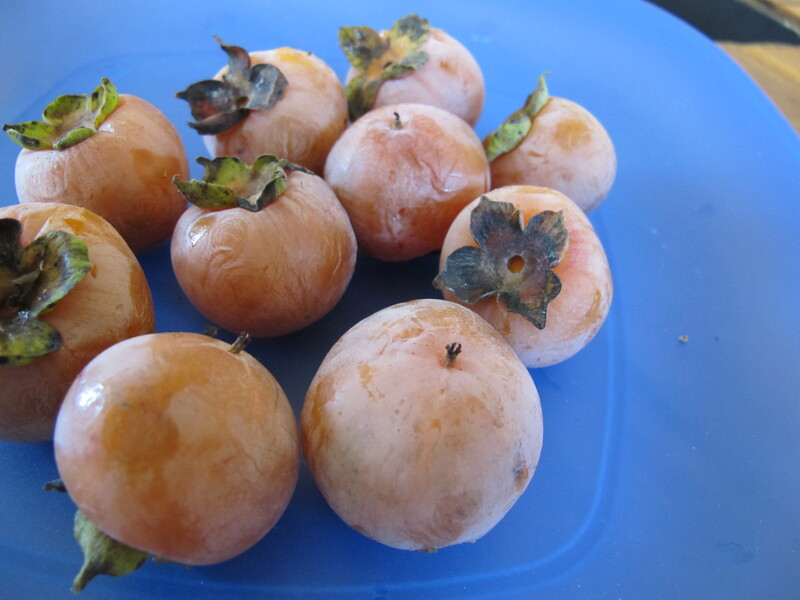 Aaron collected persimmons in Tower Grove this weekend and processed them through a sieve, then made fruit leather. Turned out way better than expected! Hmm, I actually thought I’d missed our shot at persimmons this year, because the trees I’d scoped out (in Tower Grove) were almost bare when I checked a couple of weeks ago (they had plenty of [unripe] fruit a month ago when we got pawpaws). Guess he must have had a different spot. Yes, I think my MIL has some kind of conical sieve thing that might work better than the Foley food mill. Glad yours turned out well!